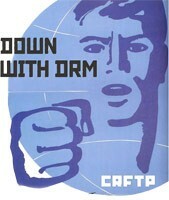 When does the industry finally recognizes that DRM doesn't work? It harms the customers and can't prevent copying. It's futile. HDCP 'master key' supposedly released, unlocks HDTV copy protection permanently: "Just as the MPAA is preparing to offer movies to customers at home while they're still in theaters by limiting playback to DRM-protected digital outputs only, the HDCP protocol they rely on may have been cracked wide open."